Great condition no holes or tears. Shoulder 18". Neck 17" (Flat, Button to Button Hole). Length 28". Pre-Owned in Good Condition. Made of 100% Cotton Size XL Slim Fit Beautiful condition Underarm to Underarm 21 in. (flat) Shoulder to Shoulder 19 in. (flat) Sleeve 26 in. Length 24 in Zara Slim Fit Man Black Check Long Sleeve Shirt is perfect with jeans! Zara Man Plaid Shirt. - Family owned and operated. We have a passion for clothing, and believe first and foremost in honesty and integrity. Size : Large Slim Fit. Length: (bottom of collar to back hem). 30. Collar to hem: 28". shoulder to shoulder: 16.5". Shoulder to shoulder 19.5". sleeve- shoulder to cuff 26.5". front length (top of shoulder to hem) 30.5". back length (top of shoulder to hem) 32". Pattern: Heathered. Color: Blue. armpit to armpit 22". Zara Man Hockey Print Shirt. Size Small Slim Fit. The shirt is in excellent condition with a classy striped look. • Light blue and white stripe color. • Size is Small. Made of 98% Cotton and 2% Elastane Size XL Slim Fit Beautiful condition Underarm to Underarm 21 in. (flat) Shoulder to Shoulder 19 in. (flat) Sleeve 26 in. • Zara man. • White dress shirt / black pocket lining. • Slim fit. • Get it before it’s gone. Pit to Pit (armpit to opposite armpit)-23". Length (neck to bottom)-31". Item is in great used condition. Item has no holes or stains. 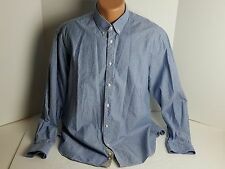 Zara Man Denim Couture light blue shirt, very subtle dot print to the fabric. Slim Fit Button Front Shirt. FABRIC ~ 100% COTTON. SEE PICS FOR DETAILS. Length 29" ~ Armpit to Armpit Chest 20" ~ Sleeves 26". • Zara man. 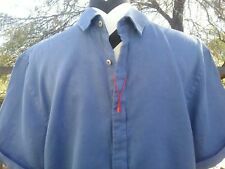 • Blue dress shirt w front pocket. • Slim fit. • Lots of life left. • Size Large. Solid Material from Zara man High Quality Short Sleeve Dress Shirt: Made from High Grade 100% Cotton, soft material, good capability of tenderness and comfy, solid enough and it is hard to beat. You can also refer to our pictures and details. Slim Fit Button Front Shirt. Length 28" ~ Armpit to Armpit Chest 19" ~ Sleeves 25". FABRIC ~ 100% COTTON. SIZE ~ SMALL. Sleeve: 28 in/ 71.12 cm. Length: 29 in/ 73.66 cm. Chest: 22 in/ 55.88 cm. Color: White. Zara Man - Denim Couture. - Nice Blue Elbow patches on both sleeves. -Nice Casual Blue Plaid mix (Blue, white, gray, black). Slim Fit Long Length Button Front Shirt. FABRIC ~ 100% COTTON. COLOR ~ BLUE / White. Length 35" ~ Armpit to Armpit Chest 22" ~ Sleeves 27". Slim Fit Button Front Shirt. Length 27" ~ Armpit to Armpit Chest 19" ~ Sleeves 25". FABRIC ~ 100% COTTON. SIZE ~ SMALL. 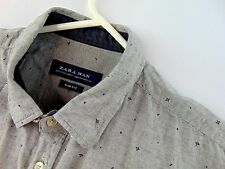 Zara Man Shirt Mens Button Front Slim Fit Size Large Long Sleeve Floral Cotton See images for details Any questions please contact us Preowned Condition One Day Handling Time Shipped with USPS First Class Package. Zara Man Sport Classic - Brand Casual Shirt Men's Medium - Note: Slim Fit Long Sleeve Button Down Collar Blue With White Pin Stripe Button Up Tailored Fit Fitted Shirt - See Measurements - 100% Cotton Pre-owned - - See All Photos - For best fit please look at all measurements - Measurements - ● 23" armpit to armpit ● 31" sleeve length ● 28" top to bottom of hem Front ● 30" top to bottom of hem Back Thanks For Looking Please Don't Forget To Drop By Our Store And Check Out All The Other Great Items We have. - Sweet Bargain Buys! Pit to Pit:23". Sleeve Length:25.5". Pit to Pit:22". Top of Collar to Hem:32". Pit to Pit:22". Sleeve Length:7.5". 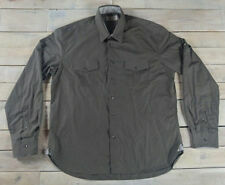 A very nice stylish shirt in excellent pre-owned condition. Shirt Length (Neckline-Bottom): Approx. No local pick up available. Zara slim shirt/ blue and white checkered / Size Medium/ Made in Turkey. Zara slim fit, checkered men's shirt. Long sleeves,beautiful pockets with trim on sleves. Blue and white size Medium. Color: Blue, White, and Black Plaid with Striped Flip Cuffs. Sleeve (From Midline of Collar): 34.5". Condition: Very good. Small pick on the back left side. Chest: 22" - Total: 44".